Microsoft’s Bing Translator app for Windows Phone app has been updated to add languages and more. No network connection in Barcelona? No hay problema. Simply download the language pack you need and the Translator App is functional offline. The highly optimized and compressed translation system was built using the same technology that powers Bing’s translation features your familiar with on the Web. Have a word in mind? The Translator App also enables instant translations using keyboard input. 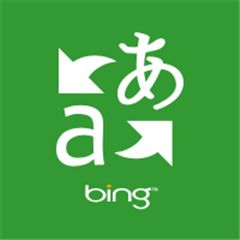 When online, the supported languages for translation expand to over 30 (see the Bing Translator language list here). For several of the languages you can also playback the spoken version of the translated sentence. This is particularly handy for languages in a script you can’t read. Want to have a conversation with a local? With the voice translation you can communicate in English (both US and UK), German, French, Italian, and Spanish. Once in the mode and connected online, you simply tap the icon, speak and tap to translate. Voila! Use your camera to translate printed text, voice recognition to translate spoken text, or the keyboard to enter text that you want to translate. Use your phone’s camera to make translating signs, menus, newspapers, or any printed text a snap. Just aim the camera at the text and see the translation in secds. Download languages and phrase books so you can translate text and images when your phone isn’t connected to a network. Speak a word or phrase that you want translated and hear the translations spoken in a native speaker’s accent. Voice translations require a network connection. Improve your vocabulary with the Word of the Day on the Start screen. When you’re traveling, need to overcome a language barrier, or trying to learn a foreign language, Translator is your go-to app. Written by: Hyde13 on November 15, 2013. Last revised by: WP7 Connect on November 14, 2013.